ALAMO HEIGHTS, Texas (AP) — FOR SALE: One tiny kingdom, with many thrones. But it doesn’t come with a hereditary title. “There’s a lot of me in there,” he says, sitting in front of the corrugated metal garage he’s dubbed his Toilet Seat Art Museum. There’s a lot of, well, everything in there. Smith has one seat decorated with a chunk of the Berlin Wall and another with a piece of insulation from the doomed Shuttle Challenger. There are lids festooned with flint arrowheads, Civil War Minie balls, Amtrak train keys, Pez dispensers — even $1 million in shredded greenbacks from the Federal Reserve Bank in San Antonio. Every inch of door, wall and ceiling space is covered. The sign out front — a commode lid, of course — says Smith’s art is “NOT FOR SALE.” But after five decades and countless offers, the king says everything must go. Still, walking away will be hard. “This is my life’s history here,” he says. It started more than 50 years ago, as a way to display hunting trophies. Smith says his father would spend hours cutting out, sanding and varnishing wooden shields to mount his antlers. The son figured a toilet seat lid would do just fine. Smith had promised his wife, Louise, that he’d stop at 500. That was 850 toilet seats ago. “If I would have just read my Bible as many hours as I spent on my toilet seats, I’d be a better man,” he says with a twinkle in his eye. Smith’s workshop is stacked floor to ceiling with cardboard boxes filled with odds and ends. He engraves his works with cast-off drills donated by a local dentist. Smith readily admits that he’s no Jasper Johns. Smith toiled in obscurity until an artist who’d come by to see some of his oil paintings caught a glimpse of his garage and told a local TV station. “They twisted my arm so until I said to come on,” Smith says. The piece aired on a Friday. The following Monday, two other stations came calling. Then came the tourists. “And so I just slung the door open,” he says. Smith officially opened as a museum in 1992. Since then, visitors from every state and 83 foreign countries have made their way to this little municipality completely surrounded by the city of San Antonio. He asks that visitors make an appointment. But he doesn’t turn anyone away. He regales tourists with the tale of “Old Rip,” the “horny toad” who emerged alive after 31 years entombed in the courthouse cornerstone in his hometown of Eastland, Texas. He also treats each to a recitation of “When Earth’s Last Picture is Painted” — a Rudyard Kipling poem he was assigned to learn in fifth grade. 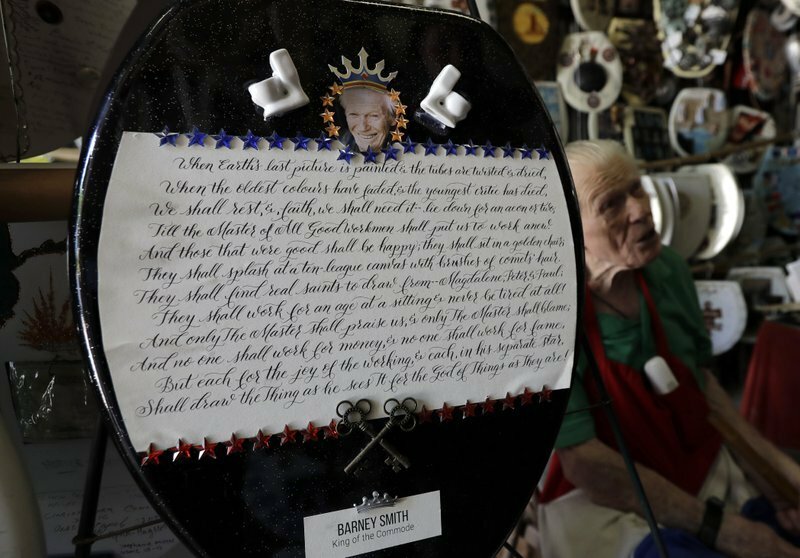 No one leaves without signing his guestbook — and a toilet seat. Smith is currently working on a seat commemorating the 2018 Winter Olympics in South Korea. He suspects that will be his last. In 2014, he lost Louise, his wife of 74 years. A few months ago, he fell and broke two ribs. Daughter Julia Murders says they’ve had offers. A man from India, who wanted to buy the collection for his daughter, offered $20,000 — about $15 per seat. “We discussed it and we said, ‘Daddy, you know, you’ve been doing this your whole life. The last few years of your life, you’ve done nothing BUT this,’” says Murders, 69, who lives nearby. People have told Smith that he’s sitting on a pot of gold. But Smith isn’t looking to cash in. Austin writer and publisher Daedelus Hoffman says Smith and his collection are priceless. And he wants to help preserve that legacy. His Cattywampus Press raised more than $30,000 to produce a full-color, cloth-bound book about Smith. 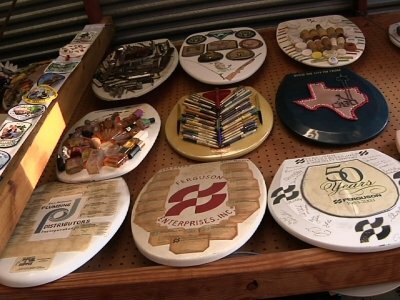 “King of the Commode: Barney Smith & His Toilet Seat Art Museum” is being released Saturday, just in time for Smith’s 97th birthday. Smith would love for the collection to remain where it is. But if it must move to remain intact, so be it. “I’m ready to give it up and let it go to London,” he says.